Designed for car computers this device will shutdown when the computer connected to the interface is not powered up; unlike competitor products that always draw power from the OBD II port - draining the battery if left permanently connected. This interface also supports an optional bluetooth module. Our bestseller, connects using your laptop's USB port and supports high speeds upto 2.0 Mbps. Don't be fooled by imitations the OBDPro scantools are the only ones in their price range that offer free firmware upgrades and a detached cable for the OBD II end allowing for maximum flexibility in ensuring that the interface will always fit on the OBD II port of your vehicle. lowest cost entry level multi protocol scantool on the market - supports all OBD II protocols but does not offer the firmware upgrade capability or enhanced features like the other OBDPro products. All the OBDPro scantools support OBD II protocols found on vehicles manufactured after 1995 . Includes everything you need to get started with reading your vehicles "brain"
A PC computer, a Pocket PC PDA, or PalmOS to look at the OBD data. A software program running on your computer to capture the OBD data. The above setup offers maximum functionality in working with OBD2 systems and vehicle networks. 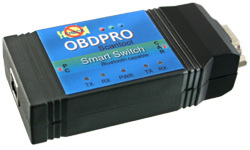 The ObdPro setup acts as a virtual Swiss army knife in working with in vehicle networks. Other handheld OBD II tools available in the market can only perform a single function of reading the error codes and turning off the check engine light, they cannot view traffic on the OBD II bus, moreover when new messages are introduced in vehicles the handheld OBD2 units cannot read the new messages. With the OBDPro there are no such limitations. Some automotive repair shops charge almost $70 just to tell you the error code on a check engine light. You can do it for free with this tool, moreover you can even do advanced diagnosis such as monitoring fuel consumption based on your driving habits and even control some of the accessories in your vehicle via the OBDPro scantool. See datasheet for an example of controlling the power windows on a GM vehicle. The above diagram illustrates how to setup the OBDPro scantool. Look under the dashboard of your car and you should see a connector similar to the one circled below, this is known as a DLC (data link connector) and is typically located in the drivers compartment (ocassionally on the passenger side). Generally the DLC connector is right below the steering column. It might have a cover on it so look closely. Install a suitable diagnostic software on your computer, We have listed some of the popular OBD II software here. There is software for practically all computers and even PDA's. You can also use hyperterminal to talk to the OBDPro scantool, please refer to the datasheet for more info on using a serial terminal with your OBDPro. Connect the RS232/USB cable between your PC and the OBDPro scantool and then launch your OBD Diagnostic software. You will need to configure your software so that it talks with the correct serial port that is connected to the scantool. The car's ignition needs to be turned on for the OBD2 data to be available. The car does not need to be running but the ignition key needs to be in the start position, not accessory or off. If you run into problems in setting up the scantool refer to the FAQ for troubleshooting hints. If your computer does not have a Serial port we also have a USB version available.